WB: Recombinant A. victoria GFP protein. Designed to detect GFP and its variants in ELISA (sandwich or capture), immunoblotting and immunoprecipitation. Fluorescein conjugated anti-GFP was assayed by immunofluorescence microscopy on prokaryotic (E.coli) and eukaryotic (CHO cells) expression systems and was shown to detect GFP containing inserts. Significant amplification of signal was detected using fluorochrome conjugated anti-GFP relative to the fluorescence of GFP alone. In case of unexpected background, use pre-adsorbed secondary antibodies. Shipped at 4°C. Store at +4°C short term (1-2 weeks). Store at -20°C. Avoid freeze / thaw cycle. GFP Fluorescein Conjugated Antibody was prepared from monospecific antiserum by immunoaffinity chromatography using Green Fluorescent Protein (Aequorea victoria) coupled to agarose beads followed by solid phase adsorption(s) to remove any unwanted reactivities. Our Abpromise guarantee covers the use of ab6662 in the following tested applications. Block: Blocking buffer for 30 minutes at RT. 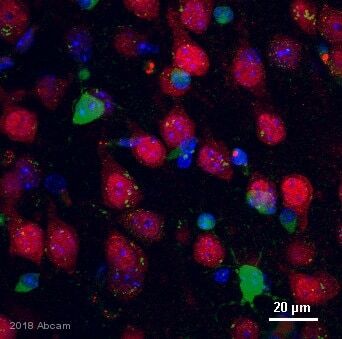 Immunohistochemistry (Formalin/PFA-fixed paraffin-embedded sections) - Anti-GFP antibody (FITC) (ab6662)Kim at el PLoS Genet. 2018 Feb 8;14(2):e1007204. doi: 10.1371/journal.pgen.1007204. eCollection 2018 Feb. Fig 4. Oscillation of Cyclin E and E2F target gene expression is deregulated in de2f1b mutant salivary glands. 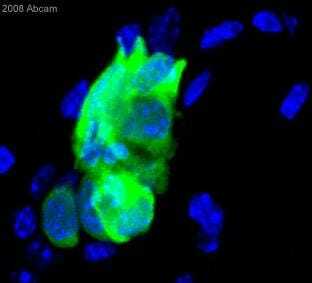 Salivary glands of control and de2f1b mutant early (80–85 hr AEL) third instar larvae expressing PCNA-GFP (green, ab6662) are stained with anti-dE2F1 (red). The region where high PCNA-GFP is observed with low dE2F1 is marked by an asterisk. For Immunostaining, third instar imaginal discs and salivary glands were dissected in PBS and immediately fixed in 4% formaldehyde in PBS for 20 minutes at room temperature with the exception of tissues subjected to anti-dE2F1 staining that were fixed for 30 minutes on ice. Fixed tissues were then washed with 0.3% PBST (0.3% TritonX-100 in 1XPBS) and 0.1% PBST (0.1% TritonX-100 in 1XPBS). Samples were incubated with appropriate amount of primary antibody in 0.1% PBST and 1%BSA overnight. Samples were then washed with 0.1% PBST, incubated in secondary antibody in 0.1% PBST and 1% BSA for 2 hours, followed by several washes in 0.1% PBST prior to mounting. Tissue: Drosophila melanogaster late stage embryonic central nervous system. Primary antibody: Anti-GFP antibody at a 1/1,000 for 1 h at RT. Secondary antibody: AlexaFluor 488™ conjugated anti-Goat antibody at 1/300 for 45 minutes at RT. Panel A: shows a lateral view (ventral left). Panels B and C: shows ventral views of whole mount embryos at 63x magnification (plus 2x digital zoom). In all panels, anterior is up. Staining: tau-GFP cell bodies (large arrowhead) and axons of motorneurons (arrow) and interneurons (small arrowhead) as green fluorescent signal. 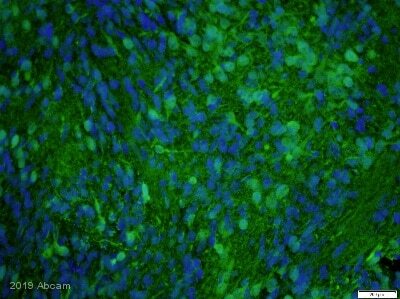 ab6662 staining mouse brain tissue sections (inducible GFP reporter) by IHC-Fr. The tissue was paraformaldehyde fixed and blocked with serum and then incubated with the antibody at a 1/1000 dilution for 1 hour. Staining is shown in the left hand panel. 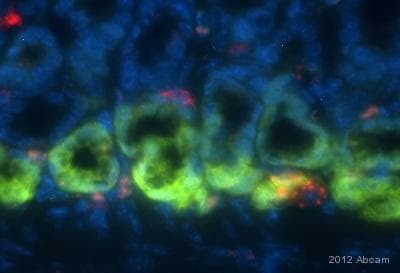 The middle panel shows staining with a rabbit anti-GFP antibody and the right hand panel shows the merged images (plus DAPI). ab6662 gives no noticable background and it is found that when viewing on an epifluorescent the exposure time is significantly reduced. Tissue: Sf-1:Cre mice crossed to the Z/EG reporter line. Mouse brain (coronal view, 20X magnification). Fixation: 4% PFA/PBS with o/n fixation, and subsequently transferred to a 30% sucrose solution. Antigen retrieval: Frozen in OCT freezing medium (Sakura) and cryostat sectioned at 40 microns. Goat anti-GFP was used at 1/500 dilution in free floating imunnohistochemistry to detect GFP. Secondary antibody: Fluorchrome conjugated Anti-goat IgG secondary antibody was used for detection at 1:500 at 1/10,000 for 45 minutes at RT. Localization: Sf-1+ neurons and their processes of the ventromedial nucleus of the hypothalamus. 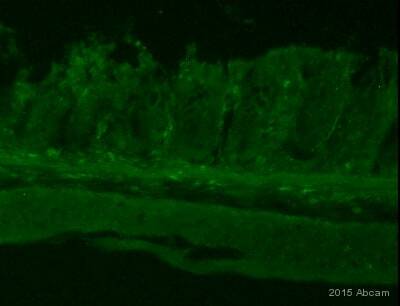 Staining: eGFP as green fluorescent signal and sections were counterstained with DAPI. These pictures show confocal immunofluorescence using GFP-expressing glial cells (green) transplanted into the lesioned rat spinal cord. Detected using ab6662 and a standard FITC filter set. Axons are labeled red by an antibody to neurofilament-200 and a rhodamine secondary antibody. The upper panel shows the centre of the transplant site at low power. Numerous GFP-positive cells can be seen mingling with axons. The lower panel shows, at high power in a single optical section, how ab6662 reveals the morphology of the transplanted cells to such an extent that their close interactions with axons are obvious - the cell depicted can be seen wrapping around a neurofilament-200 positive axon. These images were kindly supplied as part of the review submitted by Andrew Toft. Publishing research using ab6662? Please let us know so that we can cite the reference in this datasheet.